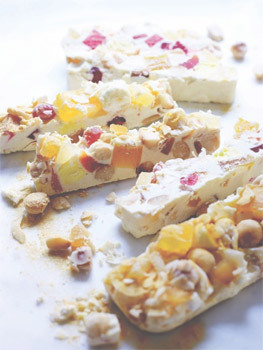 This Tropicana Rocky Road takes a wonderfully summery twist to a classic sweet treat. It uses gloriously exotic ingredients along with our delectable native nut, the macadamia! By using our luxuriously, creamy and buttery nut, you'll turn your Australia Day spread true blue. Spray and line a brownie tray – you could also use a lamington tin or muffin tray or fill rings on baking paper. Spread out the finely chopped chocolate evenly (rather than in a mound) in a large stainless steel bowl and place over a medium saucepan with a few centimetres of barely simmering water in it. When about two-thirds of the chocolate has melted, stir through once. Add the coconut oil and stir a couple more times to ensure that all the chocolate melts – don't mix too much, or overheat, as the chocolate will become grainy. Take the bowl off the pan. Combine the remaining ingredients, except for the passionfruit powder and a few cherries and marshmallows reserved for garnish, in a large bowl. Pour in the melted chocolate and fold through. Stand for 2 minutes then pour into the prepared tray. Decorate with the extra cherries, marshmallows and coconut and sprinkle over the passionfruit powder. Allow a couple of hours at room temperature to properly set – you could speed this up by popping it in the fridge for 30 minutes, but don't leave it any longer. Lift out of the tin and slice into pieces. Store in an airtight container somewhere cool. As Australian macadamia growers prepare for a cracking harvest, we invite you to discover the world's finest nut in its native home. This tour will explore the many aspects of the macadamia including where and how they are grown and processed. You will meet our proud and passionate growers, be treated to deliciously different ways to enjoy them and learn more about the health benefits of this magical food. Ask questions, satisfy your tastebuds and enjoy! Macadamias are primarily grown along the eastern seaboard of northern New South Wales and Queensland, from Nambucca Heads in the south through to Mackay in the north. There is a small area under cultivation in Western Australia. Farms range from smaller orchards with 1,000 trees to large operations with more than 300,000 trees. The macadamia industry is a major contributor to the regional economies in which it operates providing direct employment on farm and in the processing sector and indirectly through a range of support services. This is complemented by other economic benefits created by the purchase of on farm machinery, fertilisers and other goods to maintain and expand production. Australian commercial production of macadamias began in the Northern Rivers region of New South Wales and this region is still the primary production area with 500 growers producing 60% of the Australian crop. The Northern Rivers boasts some of the most fertile soils in Australia, formed by volcanic activity many millions of years ago. Along with good annual rainfalls it is the original home and perfect location to grow macadamias. The Northern Rivers is a region where local growers have proven a commitment to the natural environment, through good environmental practices and other activities such as on farm regeneration of rainforest remnants which used to form part of the Big Scrub rainforest. The Northern Rivers is an area of superb natural beauty and is characterised by its waterways. The rivers have helped to shape not only the landforms but also the economic, cultural and recreational life of the entire region. They provide a rich natural bounty and are the lifeblood of the farming community; they are also a haven for frogs, water birds and wildlife. Flowering takes place in August and September with optimum weather conditions, including warm temperatures, ample sunlight and sufficient but not excessive rainfall, throughout the growing season crucial for good-quality flowering. Nut development from full flowering to kernel maturity takes about 30 weeks. Shell hardening takes place in early December followed by rapid oil accumulation in late December and January. From January to March, nuts mature by converting sugars and starches to oil - a very important process which determines the final quality of the nut. The nuts, encased in hard, woody shells, fall to the ground between March and September each year and are collected from the ground using purpose built harvesters. Careful drying is a critical step to maximise shelf life and quality of the end product. At harvest the nuts have a moisture content of up to 30%. Drying can take up to three weeks and reduces the moisture content to around 1.5%. The kernel shrinks away from the inside of the shell and allows the shells to be cracked without damaging the kernel. Macadamias have a completely unique creamy, buttery taste and soft crunch which make them a delicious food to snack on. They are also a great cooking ingredient adding taste and texture to all types of dishes from salads to savoury and are best known for the luxuriousness they add to desserts. Macadamias are used in many other premium foods such as breakfast cereals, snack food bars, confectionary and ice-cream. Cold pressed macadamia oil is gaining popularity in Australian kitchens. It has a delicate flavor ideal for salads and a low flash point which makes it an excellent oil to cook with. Macadamia oil is also widely used in cosmetic and skin care products and is recognized by beauty care professionals for its exceptional skin enhancement qualities. There are 850 macadamia growers in Australia with 500 located in the Northern Rivers region. Many of the Northern Rivers macadamia growers are small landowners who have entered the region and the industry from other walks of life. They are proud to produce what is regarded as a national icon. During this tour you will meet our growers including one of the largest who is responsible for orchards across all the major growing regions, a grower who is leading the charge to conserve our threatened wild species, one is who working with leading researchers to breed varieties of macadamias which will be more climate tolerant and higher yielding and another grower who is leading the development of a sustainable organic sector. While most macadamias are sold in major supermarkets around the world, there is also a band of creative entrepreneurs working to produce unique and innovative products using macadamias. During the tour you will get the chance to meet with some of these producers. Macadamias are native to Australia but are renowned world-wide for their excellent health credentials. They contain a potent bundle of heart protective nutrients including -good fats' (plant omega-3s and monounsaturates), plant sterols, dietary fibre and antioxidants like vitamin E and manganese. Research in the past 15 years has conclusively shown that regular nut consumption, including macadamias, will significantly reduce the risk of heart disease. There is also increasing research supporting the role nuts can play in diabetes and weight management. Our macadamia growers are committed to clean, green production and world's best practice farming methods to help create a sustainable future not only for themselves but for the communities in which they work. The Australian macadamia industry invests millions of dollars annually in ongoing scientific research towards continually improving all parts of the growing and production process. The Australian macadamia industry leads the way in biological pest control (using natural methods to manage pests and diseases) and our growers actively look to innovative and alternative solutions in the management of their orchards, including the use of integrated pest management (IPM) to control pests and reduce the use of chemicals. And our record speaks for itself – for the last 15 years we've received a 100% clean bill of health in the Federal Government's National Residue Survey, which monitors residues of agricultural chemicals and environmental contaminants in Australian food. This record is unmatched by any other Australian fresh product. We are also passionate about conserving our natural resources – the water, soil, air, native vegetation and wildlife. Many macadamia farmers are regenerating remnant rainforest on their farms as a way of protecting the natural topography and waterways of the region. This creates a haven for native animals and beneficial insects as well as improving overall soil health. Many are doing their bit to protect other fauna such as the endangered Birdwing Butterfly, with growers planting Richmond Birdwing vines for the butterfly to lay its eggs on and for caterpillars to eat. The Australian Macadamia Society has established the Macadamia Conservation Trust, a not-for-profit registered Environmental Organisation designed to support the protection and conservation of threatened wild macadamia species and their habitat, and enable research into the ecology and genetics of macadamias. Australia is the leading producer of macadamias in the world, producing more than 30% of the world crop. They represent one of Australia's largest horticultural exports valued at around $120-130 million per annum. The Australian industry has used its position as market leader to gain market share and a price premium in export markets. Macadamias are exported to more than 40 countries globally, with primary export markets including Japan, Europe and North America. New markets such as Taiwan, Korea and India are expected to provide even further market growth. Australia's unrivalled investment in research and development, world-class farming practices, and commitment to clean, green production from seedling to serving, means that our macadamias are the best quality, best tasting macadamias in the world.